Visit of some places of electric innovations on ferries and shipping in Norway. I am grateful for having taken part in the study trip organized by the Project ELMAR and I would like to share the impressions of that trip. Aim of the tip were visitations of electric water bound which led us to Norway to visits some places of the electric innovations in ferries and shipping. On Tuesday September 18 early in the morning, we started our round trip in Bergen. First stop was Oppedal where we crossed the Sognefjord. We took the ferry "Ampere" one of the first electric ferries. After crossing the Fjord, we had a meeting with presentations about the ferry itself and technical aspects of propulsion and charging in a nearby hotel. 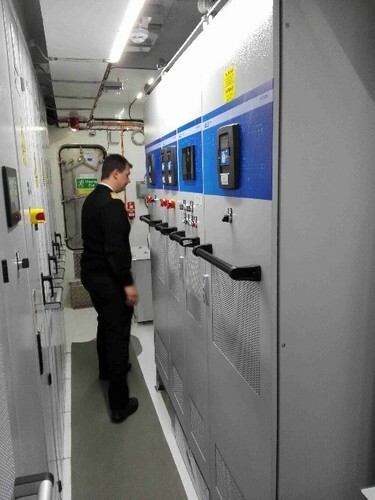 Accompanied by SIEMENS experts and by guidance of the captain and his crew we had the opportunity to inspect the bridge and the switching room of the electric ferry. The ship itself is a catamaran, fully built of aluminum, driven by two 500kW engines and equipped with a battery pack of two-500kWh capacity. The battery charged on every side of the ferry link. Because of the relatively weak electric grid in this region, a special appliance for charging is in place: a 250kWh battery buffer. This buffer charged slowly and steadily from the grid and discharged into the ferry by a much higher electric current and in a short period. I renounce to give the technical aspects in detail here. The day ended by continuing our travel along the shores of the Fjord through lots of tunnels and crossing the fjord. We stayed overnight in a museum like hotel: very exciting, but this would be another story. Next day we set out very early almost in the dark and headed for the place Flåm. Here we embarked the "Future of the Fjords" heading for Gudvangen. The ship is a class of its own, a futuristic catamaran, fully built of carbon fiber. The cruise went through the upper end of the Sognefjord – a very scenic sailing. On board of that ship we had also the opportunity to inspect the bridge and the engine room with the battery system. 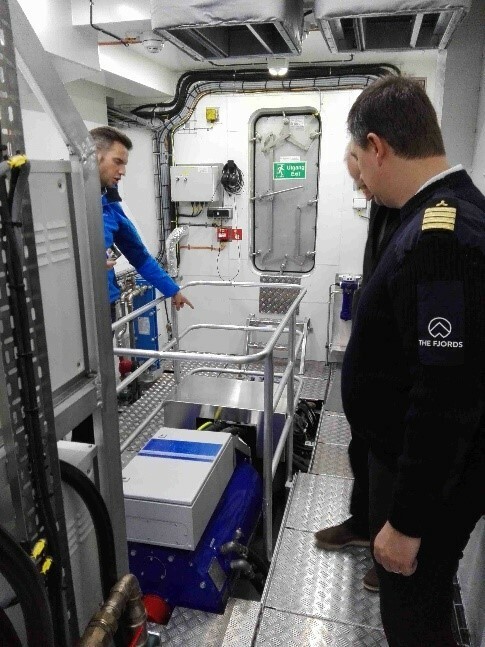 Because of the much longer travel time of around two and a half hours, the battery pack of this vessel is of 2.4MWh in total installed in each of the catamaran hulls, port and starboard. In principle, the propulsion system is comparable with the ferry “Ampere” we visited previous day. The power of each main engines is 450kW. 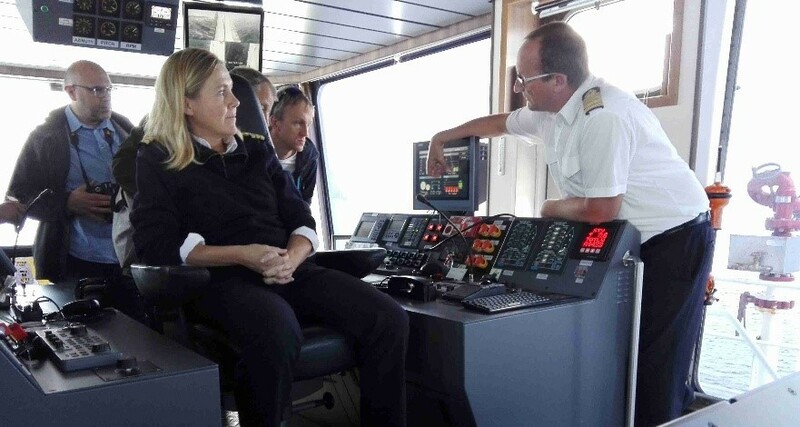 With these 600 horsepowers, the ship can travel with 13 knots (24 km/h). 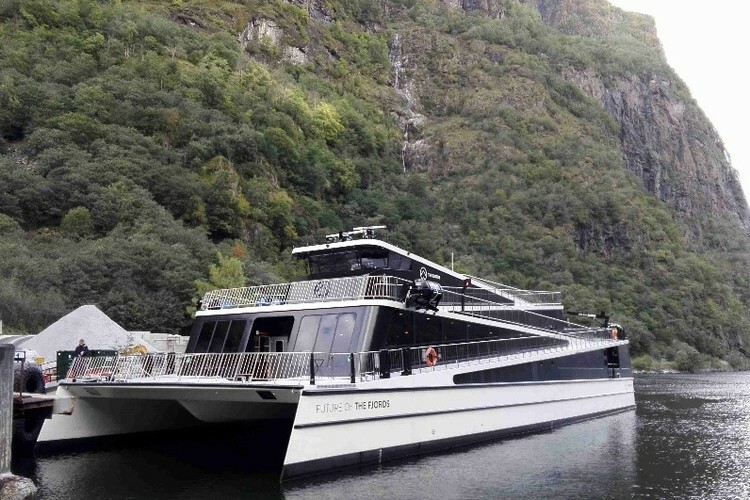 The futuristic design of the "Future of the Fjords" offers a full access of all decks by ramps very important for disabled people. From Gudvangen we continued the travel to Omastrand to the Fjellstrand shipyard that build the electric ferry "Ampere". Now a new ferry-ship is at the berth for equipment and finish. Bigger and longer than the "Ampere" and for a longer sailing distance. Guided by the Sales Manager Mr. Tole we visited the building site onboard. A seeming chaos and a very complex one. (Not a chaos, of course). Finally, my resume: Electric propulsion especially of ships of a distinct travel distance I is highly meaningful, also for longer distances is an electric drive feasible by using the so-called hybrid technology.